Picture from Wikipedia. 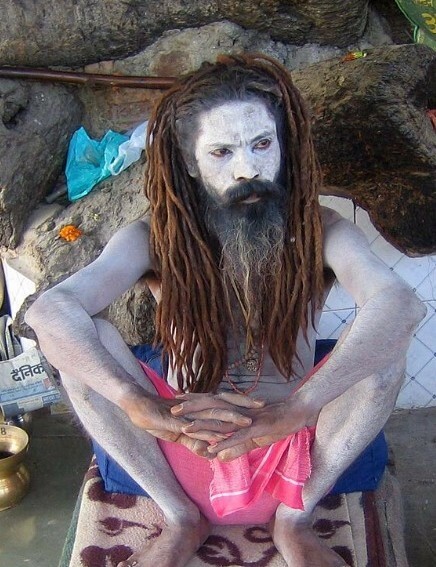 A sadhu in India, with his hair in jata. Dreadlocks, also known as dreads, locs, or jata, are intentionally matted and sculpted ropes of hair. (Wikipedia) A regular misconception is, those who have consciously formed dreadlocks do not maintain their hair, but that’s usually not the case. In fact many dreadlock care regimens require the person to shampoo and condition more often or as often as a person without locs would. • According to CNN, there’s a huge controversy in the state of San Francisco University. There’s a video that went viral of a white male student wearing dreadlocks and a black woman claiming it belongs to “their” culture. I find it interesting. CNN is unaware of further details due to the fact that both parties refused to interview. But, what gets me is, how does this “black woman” know what culture this man follows or believes in. Why does one stereotype another due to the color of there skin? Can we honestly tell where one is from? Does the color of your skin tell what religion or what one’s believes are? My conclusion, I think hair is a reflection of who we are as individuals, and no one has the right to tell us how we should wear our hair or clothes! So go on and ROCK it! • Did you know that there was a magnitude of 6.9 earthquake in South Pacific island nation of Vanuatu on Sunday, according to the U.S. Geological Survey. Ileana Fanita has joined our team! I am happy to announce Ileana Fanita is in the Pleasantville location. She has been voted Best of Westchester a few years running for her outstanding work in eyebrows and skin care. To book call Believe Salon @914 747 0778.